« Pop Japan Travel makes its grand return with the Amazing All-Japan Alpha+Omega Adventure Tour! Like most geeks, I am a caffeine-based life form. If I don’t have my caffeine dose in the (time of day at which I awaken, unspecified here because it is highly variable) I’m either cranky as all get out and extremely unpleasant to be around, or so out of it that, at least once or twice, I’ve been mistaken for a whacked out drug addict. Or both, which can be truly terrifying. Ask anyone who knows me and they’ll verify this. So yeah, I needs me my caffeine. Now my usual method of caffeine consumption is the ubiquitous soda drink — Coke™ being the preferred brand in my case. Which has caused some questioning looks from friends, waitresses and passers-by, especially during those rare moments when I am awake during the morning hours. “Wouldn’t you like a nice cup of coffee?” is what’s probably on their minds, or so I imagine anyway. So, on second thought, I guess I really do dislike coffee after all. 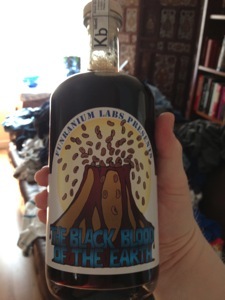 Well, Science™ has come to the rescue, thanks to a lovely concoction created by the mad scientists over at Funranium Labs — The Black Blood of the Earth. In short, The Black Blood of the Earth (or BBotE as I will refer to it from here on out) is a cold vacuum extraction of various single varietals of coffee. Single varietal meaning only one type of bean is used, rather than the usual mishmash of several different bean types you get in commercial coffee. So you get to experience the vastly differing flavors produced by the various growing regions around the planet. And one discovers that coffee has a rather subtle but nice sweetness to it. (Interesting factoid: the creator of BBotE was diagnosed as a Type II diabetic, and he created BBotE so that he could enjoy the flavors of coffee without needing to add sugar or cream to it to make it palatable.) And cold vacuum extraction basically extracts all the flavor out of the bean, while leaving behind most of the nasty acids that cause bitterness and teeth staining. And, guess what, as a nifty side benefit of this extraction process, the caffeine concentration of BBotE is significantly increased compared to regular ol’ coffee. Win! 4 parts cream to 1 part BBotE makes a rather nice iced latte-style drink. You can of course drink it straight. It is recommended that, if you do this, that it be chilled. I tried this, and was pleasantly surprised to find that I actually, truly enjoyed its taste, even without any additions. They’re really onto something here! Fortunately, rather than keeping BBotE a closely guarded secret available only to a select few, the Funranium Labs crew have seen fit to share it with the world! The cost might seem somewhat high, until you consider that (A) this ain’t your typical Starbucks vente latte here; (B) the guy (Funranium Labs actually consists of one man, a radiation scientist at Lawrence Berkeley Labs) makes it by hand (his production is normally about 9 L per day. ); and (C) because of its highly concentrated nature, your standard 750 mL bottle of BBotE equates to about a month’s worth of caffeination by Starbucks standards. BBotE is available for sale in various sizes. The 375 mL is probably the best starting point for a BBotE neophyte. The 750 mL is probably the most common size. He also offers a 1000 mL, as well as multi-packs of all three sizes. And if you are truly insane (or you want to stock up in case World War III/the zombie apocalypse/complete destruction of the world by evil aliens bent on galactic conquest/etc. happens), there’s the 4 L (!!!) Jug of Madness. BBotE is available in several varietals, including Kona, Ethiopia, Kenya, Malabar, Panama and Sumatra. There are also occasional “special” varietals which change from time to time (basically whatever he can get his hands on at the coffee roasting place). And if you’re the adventurous sort, or just can’t decide on what varietal you want, he offers two Samplers (Sampler I, Sampler II). You can order all of the above, and much more, from his online Store; or, if you’re lucky, you can obtain your BBotE fix in person from a local “dealer” if you’re lucky enough to live in a city that has one. Fortunately, no secret cash drops or meetings in dark alleys are involved. Unless you want it that way, of course; I’m sure they’d be willing to oblige you if you did.